Archbishop Chaput of Denver says, “Anyone who disagree with the beliefs and the teaching of the church on the sanctity-of life issues separate themselves from the communion with the Church”. It is not responsible to report that Vice President Joe Biden is a Catholic without reporting the above. Editor’s note: All of the above accepted, it’s Joe Biden’s local ordinary (bishop) who has the final word on this matter. President Obama publicly stated his willingness to have his own grandchildren killed by abortion. ”I’ve got two daughters, nine years old and six years old. I am going to teach them first of all about values and morals. 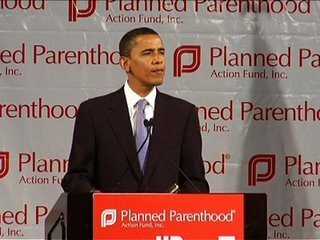 But if they make a mistake, I don’t want them punished with a baby.” (Town Hall Meeting in Johnstown, Pennsylvania, March 29, 2008). Editor’s note: How does the president expect to be able to teach his daughters about morals and values, when his own personal moral compass (and apparently his wife’s, too) is so far out of whack? 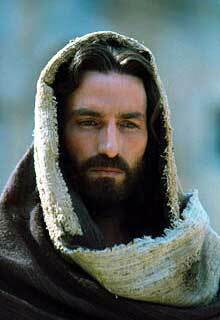 Jim Caviezel recounts the story of the lightning bolt that struck him as they were filming The Passion of the Christ. Caviezel shared the experience with the 700 Club, “I was lit up like a Christmas tree! I was doing the Sermon on the Mount. I knew it was going to hit me about four seconds before it happened. I thought, ‘I’m going to get hit.’ And when it happened, I saw the extras grab the ground. “Hideous”, “destructive”, “wicked”, and “perverted” are only some of the adjectives used by the Popes to describe socialism. From Pius IX to Benedict XVI, the popes have thoroughly and consistently condemned socialism. Given the advance of socialism in America, TFP Student Action is glad to offer its readers a brief selection of thought-provoking quotes from the Popes on the topic. 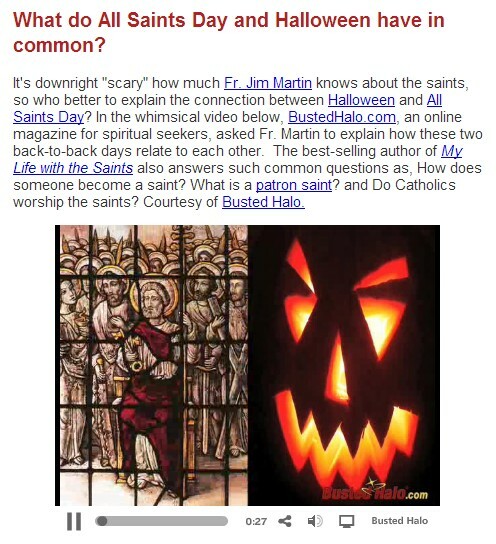 This light-hearted but informative video explains the connection between Halloween and All Saints Day, plus much, much more. No religious freedom – No social justice. Watch the powerful, short video. I’m in Steubenville tonight, preaching at Franciscan University and speaking at an important pro-life rally later. 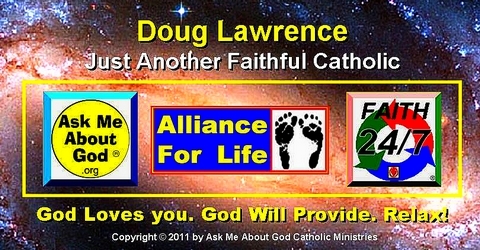 … urging as many people as I possibly can to VOTE PRO-LIFE ON NOVEMBER 6 and in every election! … click here and make as large a contribution as you possibly can! 2. That the first of mankind’s God-given unalienable Rights is the RIGHT TO LIFE! 3. That the RIGHT TO LIFE is the fundamental human right, and the one upon which all other human rights are based. Without the protection of the right to life, no other discussion of human rights can continue. 4. And finally, that abortion corrupts our whole society and retards progress on all the other issues that concern them … including the economy! In addition, I will re-state the points Cardinal Renato Martino made in an interview I conducted with him about politics and elections. You can go to www.ElectionVideos.org to watch the entire interview. As we approach Election Day, some – even within the Church – will distort and hide the fact that the Church (and common sense, by the way) make it crystal clear that the right to life is the most foundational good to preserve in any election. Without life, we don’t have anything. That’s the message I will be delivering to Ohioans throughout this week. Our other priests and Pastoral Associates are in other states — and on EWTN — preaching the same truth. We need you standing alongside us as we go all out in this final week to make sure our fellow Americans take their pro-life values with them when they enter the voting booth next Tuesday. … click here and give whatever you can to Priests for Life’s work. The other action I desperately need you to take is to PRAY!!! Storm heaven with your prayers!!! Ask the Holy Spirit to descend upon me and our entire Priests for Life team so that we might preach the Gospel of Life with power and conviction!!! Ask Him to fill the hearts of all those who will hear our preaching and inspire them to go out and renew the face of the earth!!! And know that even as you pray for me, so I pray for you. I pray that God fill you with His grace and wisdom as you go about preaching the Gospel of Life in your own community. Together let us do all we can to convince our fellow Americans to VOTE PRO-LIFE on November 6! Thank you. May God bless you. And may God bless America.